Morning ladies, I hope you're all well and, if you're in the UK, enjoying the wind! A while ago I signed up to be a pattern tester for Sara at Sew Sweetness She's a very talented sewer and the dresses she makes make me want to make dresses! Maybe one day. She put a call out for bag pattern testers and was innundated with responses. She regularly sends round an email with a bag picture and supplies list and if we want to test it we reply, she then selects some testers and I was lucky enough to be the tester of her Accordian Bag which has gone on sale today. This link will take you to the blog post about the bag and you can see what all the other testers made (and me of course, but you'll already have seen mine, unless you decide to go over there right now and abandon my post. I wouldn't blame you, I know I tend to drivel on, and my photos are rubbish). Here she is, just hanging out in my garden! The flap is made of multiple pieces of fabric sewn together and pleated. I went for a rainbow effect, not sticking to one line, but choosing fabrics from my scrap bin that I love. Creating the pleats was fiddly, but well worth it. One of the other testers used invisible thread for the two rows of topstitching that hold the pleats in place, I wish I'd thought of that. As it was, I had a hard time choosing which colour thread to use, so just went with white. As you can see, I took these photos back in January when we had snow. 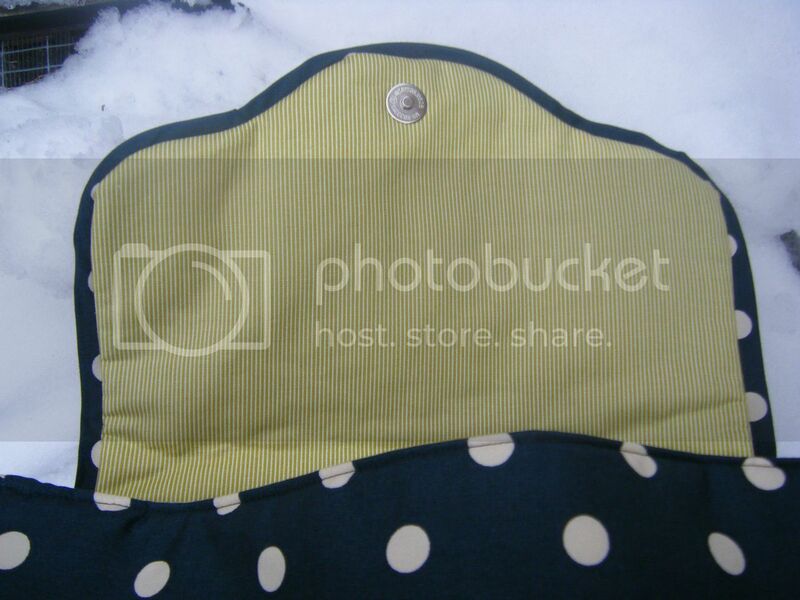 The shell is just a polka dot print I bought from Fabric Land, no particular designer. It has a long thin handle which makes it a good length, and the top is closed with a magnetic catch. As the multiple colours on the flap gave me free reign over the lining colour, I went with this green stripe. I have no idea where it's from, who made it or who designed it, I just found it in my stash! 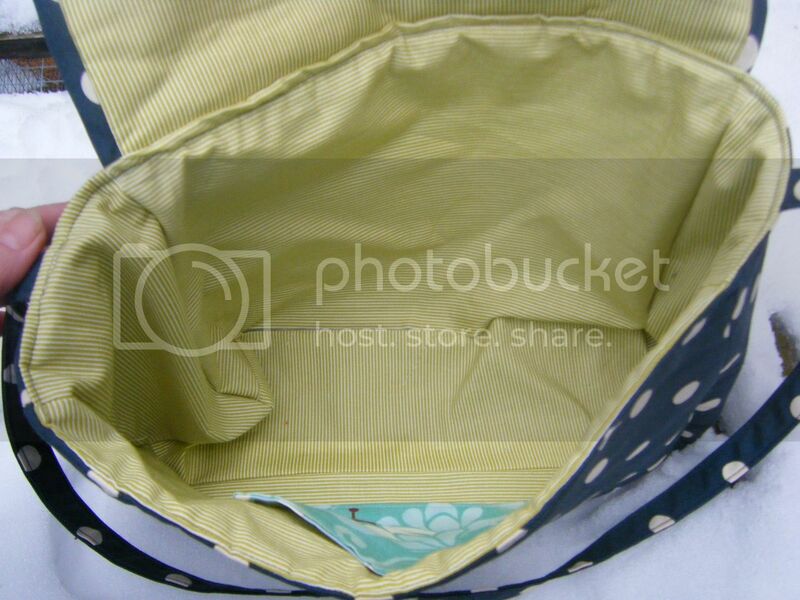 The inside pocket is the same Kate Spain fabric used on the flap. The flap has what Sara called piping, I think I'd call it a flange. It confused me no end as I couldn't find any instructions for the piping cord. It took me a while to figure out there is no piping cord, it's flat piping. And that's pretty much all I've got to say on the matter! I haven't decided whether I'll gift this bag or keep it, it's a bit small for me, I did try to get the kitchen sink in it but it didn't fit. Not with my massive sack of medication anyway! We got snowed in this morning, so the boys are happy to be home. I LOVE this bag, Wendy!!! 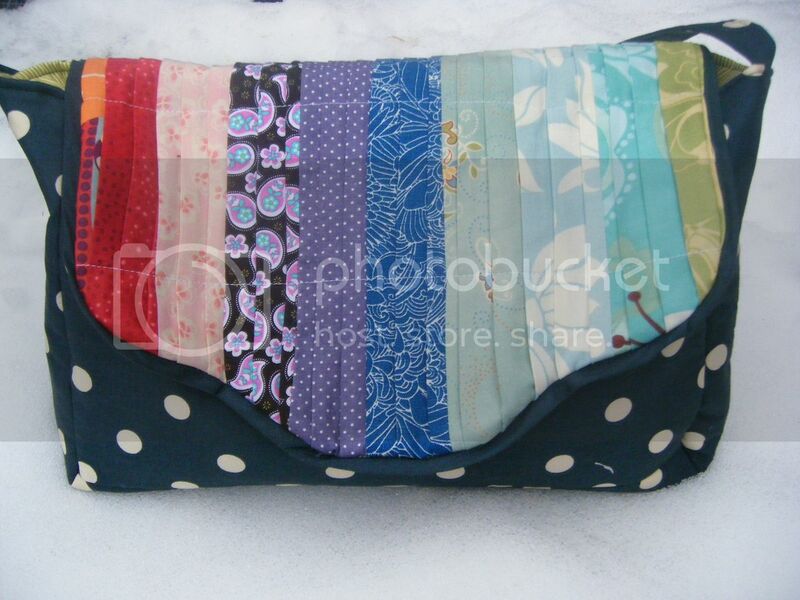 The rainbow of colours looks great against the large polka dot fabric. I love it!!! Another craft win! :D I just posted a small pillow I sewed the other day, but by hand because as I've mentioned, the sewing machine is a mystery to me, even with the copious amount of notes I took when a friend showed me. 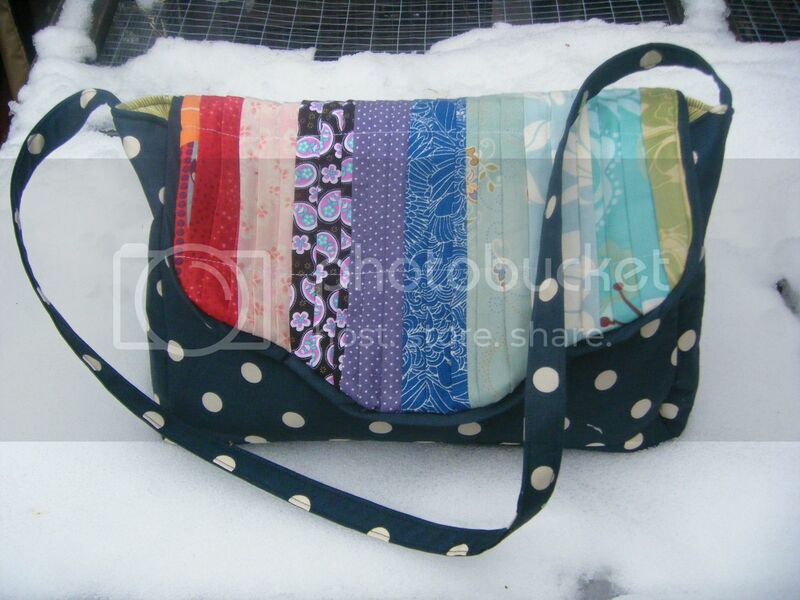 Great bag - I love your colourful flap with the polka dots - it's perfect! The bag is great. 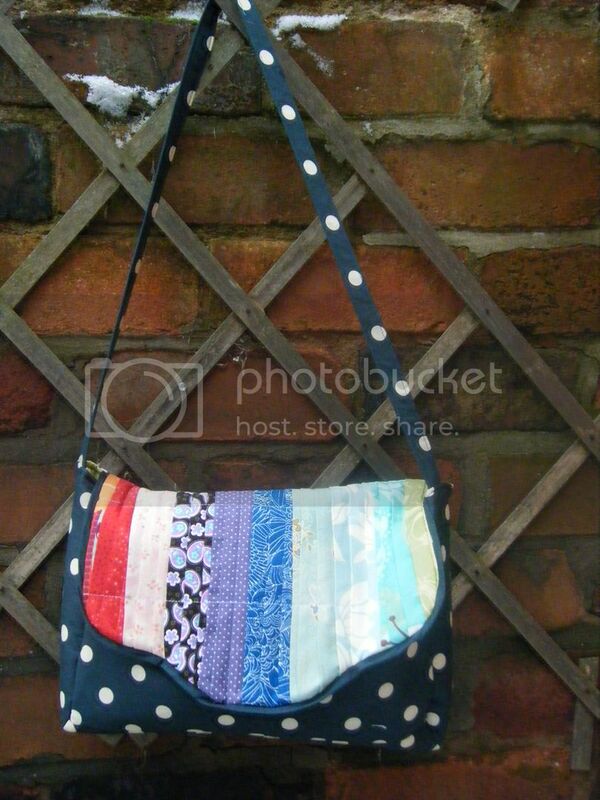 I've made a couple of bags before but that one is especially lovely. well done. love the choices of fabrics for the flap. Your bag turned out lovely Wendy, I really like your rainbow flap. Would have been confused with the piping instructions too when there wasn't actually any piping!